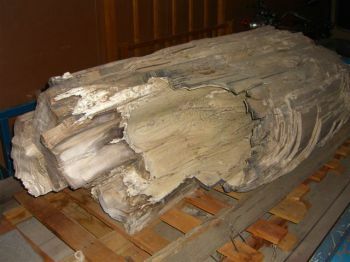 This giant Petrified Fossil Tree Log is approximately 7 feet long, 10-13 feet around, and weighs around 3,000 pounds. It was found in the Hays Springs, Nebraska area. It is all natural with no added polish or enhancements. 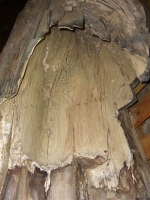 You can count the tree rings and there is fossil evidence of insect damage when it was still wood. It is opalized on one side corner. Overall it is a beautiful tan, black and white color. 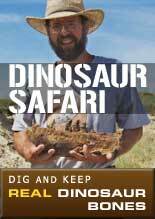 A story of where it was found with notarized signatures of the land owner and discoverer including an official bank seal is provided. Shipping is included in the price and include the trailer on which the log is displayed. Other shipping arrangements can be made for a discounted price. In order for the petrified wood you see here to become petrified, the wood must first be covered with such agents as volcanic ash, volcanic mud flows, sediments in lakes and swamps or material washed in by violent floods - by any means which would exclude oxygen and thus prevent decay. 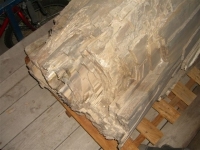 A number of mineral substances (such as calcite, pyrite, and marcasite) can cause wood to petrify, but by far the most common is silica. 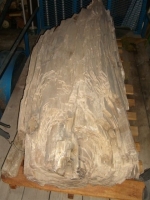 Solutions of silica dissolved in ground water infiltrate the buried wood and through a complex chemical process are precipitated and left in the individual plant cells. Here the silica may take a variety of forms; it may be agate, jasper, chalcedony or opal. The beautiful and varied colors of fossil wood are caused by the presence of other minerals that enter the wood in solution with the silica. Iron oxides stain the wood orange, rust, red or yellow. Manganese oxides produce blues, blacks or purple.